Having worn both my fingers and my laptop battery down trying to keep up with the previous sessions in the day, I didn’t live blog the general session. In brief, lots of numbers about how well the various product streams within VMware are performing. However, in my opinion the session really started to ‘sparkle’ when Joe Baguley took to the stage. There was also some valuable advice and reinforcement that each new technology doesn’t automatically invalidate the previous technology. Each technology and each approach has it’s place within an architectural echo system. To paraphrase Joe again, if you don’t subscribe to that “try running SQL in FaaS”. Continuing that train of thought, Joe highlighted that not only was it important to select the correct technologies depending on requirements or constraints. 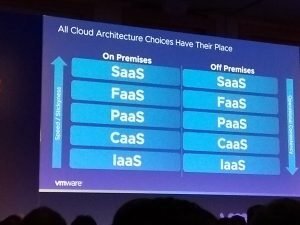 It was also important to realize that the location is no longer a restriction within the VMware stack, with services to offer CaaS, FaaS, PaaS and SaaS solutions both on premises and off premises. There was a lot more within the session, with particular focus on creating common platforms across hybrid, private and public cloud platforms. Enabling common operations, reporting and development experiences, regardless of where a service is being hosted. The overwhelming message was that there is a path toward a multi cloud operating model and VMware is forging the way in bringing this to market. I’m undecided if I’ll be blogging during sessions tomorrow. I’m attending Center for Advanced Learning – Advanced Architecture Course: Business Transformation and Frameworks and I’m unsure of the format and how much participation is required.